Posted by FTR ⋅ November 20, 2007Post a comment Email This Post Print This Post Tweet This! In 2007, Mr. Emory observed Veterans’ Day by visiting with John Loftus, a former military officer who has heroically uncovered and exposed the machinations of international fascism, bringing the forces of both law and journalism to bear on the malefactors. In addition to helping locate and prosecute Nazi war criminals that found their way into the United States after the war (many brought in by elements of the government), John has diligently pursued the Islamofascist Muslim Brotherhood. Founded in 1928, the Brotherhood fought with the Axis during World War II, jumped to British intelligence and the CIA after the war and—ultimately—spawned the Afghan mujahideen, Al Qaeda, Hamas and Palestinian Islamic Jihad. The first part of the program sets forth a new book by John Loftus—an historical novel that manifests many of the areas of investigation John encountered while working for the government. 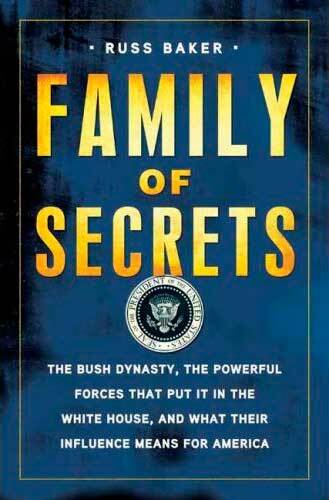 Titled The Witness Tree, the book treats the subjects o:f U.S. industrialists and financiers that backed Hitler and Mussolini (including the Bush family); the family of Allen, John Foster and Eleanor Dulles and the resulting blackmail that helped to form the fledgling state of Israel. Reviewing John’s work for the Justice Department, the program highlights his investigation of the Crusade For Freedom [CFF], an illegal domestic intelligence operation that brought Central and Eastern European fascists into the United States after World War II, many of them war criminals of the first order. Eventually, the CFF spawned a Nazi wing of the Republican Party, with its roots firmly anchored in the Third Reich and closely associated with the leading Republicans of the second half of the 20th century. After reviewing the Bush family’s involvement with Nazi industry, John also recaps the roles of Allen Dulles, British spy and Nazi double-agent Jack Philby and Ibn Saud in the founding of the state of Saudi Arabia. Treating the subject of the Muslim Brotherhood, John reviews that organization’s participation in World War II on the side of the Axis and its subsequent incorporation into the West’s “fascist freedom fighters” program during the Cold War. Heir to the Muslim Brotherhood, Sami al-Arian was part of the Bank al-Taqwa complex that was nurtured by leading Republicans and was busted in the 3/20/2002 Operation Green Quest raids, precipitated by a lawsuit filed by John. After noting that al-Arian’s name disappeared from a list of terrorist suspects, John speculated that either he had turned informant, or that his powerful friends in the GOP may have gotten him off. Revisiting the subject of WMD’s, John disclosed that he has recently had opportunity to review captured Iraqi documents indicating that Saddam did indeed have WMD’s. It is worth noting that the program was neither what the Bush administration stated, nor what its critics have claimed. Stored in specially constructed warehouses built under the Euphrates River, the WMD technology was spirited out of Iraq under the noses of American troops. Program Highlights Include: Discussion of John’s new online radio program; Richard Nixon’s participation in the Crusade For Freedom; Ronald Reagan’s participation in the Crusade For Freedom; William Casey’s participation in the Crusade For Freedom; the elder George Bush’s involvement with the Crusade For Freedom milieu and his installation of the Nazis as a permanent part of the Republican Party; the links of GOP lobbyist Grover Norquist to the terrorist funding apparatus busted on 3/20/2002; Karl Rove’s links to the same terror-funding milieu. 1. The discussion begins with information about John’s new book The Witness Tree. Highlighting the life of Eleanor Dulles (sister of Allen and John Foster Dulles), this historical novel notes that her husband was a Jew, who died under strange circumstances. Noting the Western financial support for Hitler and fascism and the behind-the scenes maneuvering around the creation of the state of Israel, the book presents historical truth packaged in the form of a novel. Not yet available in the United States as of the time of the interview, the book is available in Canada. Learn more about The Witness Tree. 2. In addition to discussing John’s new book, the program set forth details John’s new Internet broadcast, The Loftus Report. 3. Promoting yet another of John’s projects, we also highlighted his annual “Intelligence Summit”— a gathering of media personnel and intelligence officers, assembled for the purpose of sharing information and developing solutions for the world’s complex problems. Find out more about this project at: http://www.intelligencesummit.org/speakers/JohnLoftus.php. 8. In keeping with remembrance of Veterans’ Day, the program reviews information about the role of American financiers and industrialists in financing Hitler and Mussolini. In particular, the program reviews the Webb-Pomerene Act, a loophole in the anti-Trust laws that made monopolies illegal. The Webb-Pomerene Act made it legal for the “Robber Barons” to partner with their counterparts in foreign countries in the formation of cartels—international monopolies. Under the provisions of the Webb-Pomerene Act, the profits from the U.S. industrial boom of the 1920’s were reinvested abroad, mostly in German, Japanese and (to a lesser extent) Italian strategic heavy industry. For more discussion of this subject, see FTR#’s 426, 370, 532, as well as the “Introduction” to the anti-fascist books available on this website. Nelson Rockefeller’s role in financing the Nazis (along with the efforts in that regard of the rest of the Rockefeller family) was utilized by the fledgling Zionist movement to blackmail him in order to muster the requisite votes in the United Nations to create the nation of Israel. (For more about this subject, see FTR#29, as well as John’s The Secret War Against the Jews, co-authored with Mark Aarons.) John highlights the fact that at a conference in Dusseldorf in 1939, an assembly of the world’s corporate elite agreed on a plan for dividing industrial production among the world’s giant firms and allocating patent technology accordingly. This “New World Order” was to have been the realization of the cartelists’ plans, but was [temporarily] disrupted by the outbreak of World War II. 11. Turning to the subject of the Muslim Brotherhood, John recaps the history of the Brotherhood, its collaboration with the Axis during World War II, its postwar sponsorship, first by British intelligence and then by the CIA, which assisted the Broherhood’s diaspora to Saudi Arabia, where it spawned the Afghan mujahideen, Al Qaeda, Hamas and Palestinian Islamic Jihad. For more about this, see—among other programs—FTR#473. 15. Two video productions are being generated by a couple of documentary filmmakers. One is a DVD of a three-lecture series called “The First Refuge of a Scoundrel: The Relationship Between Fascism and Religion.” In addition, there will soon be a documentary about Mr. Emory, titled “The Anti-Fascist.” For more about this project, visit TheAntiFascist.com.